Today we have JA Beard, author of the young adult novel, The Emerald City. I know Grace will probably flip whens she learns about this Oz connection, but before I let her in the room, here’s a description of this book. Gail soon has bigger problems than Diana. One of her teachers hates her. Glasses shatter and fountains erupt around her. She can’t swear no matter how hard she tries. An unseen force is keeping her on campus. And worst of all, she uncovers a plot that will give one person a precious gift at the cost of thousands of lives. Now Gail and her friends must stop the plot–not just to save lives, but to win a brain, the nerve, a heart and a home in this modern urban fantasy take on The Wonderful Wizard of Oz. Hey, JA. I can’t believe the theme of your book. It’s like a miracle —all hail The Chief—because I adore “The Wizard of Oz” and I’d never even heard about it ‘til my first Mission. You must have a wonderful Muse. What’s your next project? . 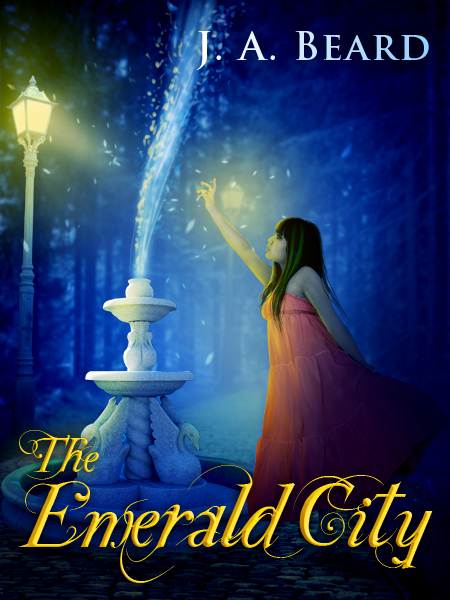 I just published The Emerald City, a young adult urban fantasy. It’s a loose re-imagining of The Wonderful Wizard of Oz in a modern setting. I was genuinely “inspired” to write this after watching a performance of the musical Wicked. So, yeah, have to give my Muse some credit (well, and Gregory Maguire, L. Frank Baum, and Stephen Schwartz, too). The story is about Kansas-native Gail Dorjee. She’s sent by her uncle to a Seattle boarding school, Osland Academy. She’s still getting over the death of her parents in a car accident and is more than a little embittered at the world. On her first day, she butts head with the local queen bee/mean girl, and stumbles onto magic. Busy day! My author says I’m like that, too. —so I have a lot of projects in the works, but the next most immediate project I have coming up for publishing is A Woman of Proper Accomplishments, a slightly alt-history Regency paranormal romance: handsome gentleman, dancing, proper English daughters, and magic. AWOPA, as I like to call it, is in the final editing stages. I’m about to begin editing of another project, Mind Crafter. It’s a fantasy story about a young magical telepath scholar who gets caught up in a conspiracy being hatched by religious fanatics. You are one busy dude and your schedule exhausts me! But before I collapse, please tell me, which of your characters are you most like? I don’t know if I’m really like any of my individual characters. I grew up a minority, so often (not always), I have a minority or outsider-type lead because the psychology of not being in the mainstream is something I can easily slip into when writing a character. Many of my characters have at least a few aspects of my personality, I suppose. The closest I ever came to basing a character closely off of me was in manuscript I wrote a few years back. That character turned out to be the villain. Though, I can assure you, I’m not a villain (most of the time). That also has nothing to do with why I’m never publishing the book. Really. Aww…I think everyone can relate to feeling like an outsider sometimes. I definitely can. That makes me curious…what’s your favorite book of all time? One Hundred Years of Solitude by Gabriel Garcia Marquez. It’s the ultimate example of depicting the entire soul of a country and a culture through a focus on a single family and a small number of other characters. Whoa. That’s a heavy book, both literally (it’s like 500 pages) and figuratively. *whispers* I’ve never read it, but my author owns it, so that’s how I know about the pages. Anyhow…moving along…In your opinion what makes a guy character swoony-worthy? Nice eyes, forthrightness, and a willingness to protect those he cares about. A hint of danger is nice, if only because it allows the female lead to “tame” the fellow a bit. Plus, although a little smart-tongued banter back and forth is fun, a guy being constantly rude is a bit off-putting. There’s a line between alluring bad boy and straight-up jerk that shouldn’t be crossed. Agreed. That pretty much sums it up! I know a Full angel that has some of that smart-tongued banter and he’s got “smirkage” too. Now, if you could go to a rock concert in Heaven, who would you go see? (*hint* you have to pick someone who is dead). Oooooh. That is a good one. And, actually, he’s kinda swoon-worthy, too, but you didn’t hear that from me, because that would be inappropriate for an Angel to say. Hmm…let’s change the subject, shall we? Confession time (for you). What’s your biggest writing sin? I have to strongly resist the urge to add detail about things that I find interesting, but don’t do much to advance the plot and risk making the story drag. This is mostly an artifact of doing research for a story. Typically, this means such details end up in the first draft but get stripped in editing. I should note that although I’m doing research for an eventual historical fiction project and I did a lot of research for my fantasy story (e.g., how far can a horse-drawn carriage reasonably go in a day, et cetera), this issue has arisen even with my more modern works. For example, The Emerald City takes place in modern day Seattle. In the course of developing the hobbies of one of the characters, Lydia Wray, I did some research into flower arranging. In the initial draft, I had several scenes that kind of went into some aspects of this in detail, including a lengthy explanation of the Northwest Flower and Garden Show. Sure, character and setting development sometimes do call for a bit of extra detail on non-plot related things, but people (and particularly me) have to be careful to make sure they remember why they are adding character or setting details and to not go overboard. That seems like a very detailed answer. 😉 But you have made me very curious about horse drawn carriages and flower arranging! So, does being detail-oriented make you more of a rule follower or a rebel? Why? I suppose I’m more of a rule follower. I’m somewhat conflict averse, so that plays into it. Many rules and societal patterns do have some value. At the same time, maybe that’s why I have so many rules-flouting characters, the vicarious thrill. That being said, I don’t support a rule just because “that’s the way it is.” Rules should exist to help people, not just for their own sake. Ha! Vicarious thrill. I think I give that to my author. And I totally agree with you that rules need to help people. Now, you already mentioned that you love research, but what else inspires you? My wife and my children. Aww, JA!!! That is really, really nice. You should probably show them this interview. And while we’re being more serious, what themes do you write about or what do you want readers to take from your books. All great things – especially girl power! And, speaking of girl power, is there anything I can help you out with? I’m networked Guardian-wise. Can you hook me up with a lottery win, or is that against the rules? It’s not against the rules, but (you knew there was a but, right?) you have to take a number on this one and the wait can tend to be a little *ahem* long. Can’t hurt to ask, though. Hey, everyone! If you love The Wizard of Oz (and if you don’t what’s wrong with you? ), you should check out JA Beard’s novel The Emerald City. And you can get to know him better in all these spots. Hi everyone, Shel here! Grace is doing a surprisingly good job on the interviews — at least she’s doing them every day, which in and of itself is quite an accomplishment. She’ll be back tomorrow with Jack Blaine and in the meantime she’s over at Kai Strand’s blog on the other end of the questioning!!! You can check it out here. April 17, 2012. Tags: author interview, confession, Gregory Maguire, guardian angel, JA Beard, One Hundred Years of Solitude, Shel Delisle, The Emerald City, The Wizard of Oz, Winging It!. author interviews. It was fun. Thanks for having me. April 17, 2012 at 1:37 pm. Permalink. April 17, 2012 at 3:09 pm. Permalink. Thanks for the great interview! I concur with your frets over research. Unfortunately, fascination isn’t universally shared. April 17, 2012 at 2:57 pm. Permalink. I concur with your frets over research. Unfortunately, fascination isn’t universally shared. Thanks for the great interview! April 17, 2012 at 3:04 pm. Permalink. April 17, 2012 at 3:22 pm. Permalink. April 27, 2012 at 1:14 pm. Permalink.